So hold on, we’ve seen this one right? Guys all sweaty… riding on a packed train to work? Oh, wait…. ok, lady is on an exotic trip and buys a necklace for her daughter, but not before the store clerk sneezes on it and puts in the bag? No, no, ok… a guy checks himself into an emergency room in Dallas feeling feverish, hangs out with 5 kids in the lobby and is sent home with some antibiotics and returns a few days later infected with a virus? Damn it… that last one really happened? You may have noticed the rampant reports as of late about the introduction of the West African virus “Ebola” into the United States. Reports tell how on Sept. 26th, Thomas Duncan was treated in a Dallas, Texas emergency room for a low grade viral infection only to be diagnosed 4 days later with the Ebola virus. Facebook, Twitter and other media sites are now abuzz with speculation of an widespread U.S. outbreak. What are we doing in preparation? How could this incident been avoided and most importantly, will it make it to Alaska? So lets speculate, worse case scenario. Its here, FEDEX flight 622 from Hong Kong. Reports are pouring in… “Anchorage, We Have A Problem” EBOLA! We did some research to find out what this virus is and what we need to know to prepare ourselves. So read up, here are 7 things you need to know about: AN EBOLA OUTBREAK. 1. You do have health insurance right? The U.S. has a strong health-care infrastructure, and experts say that means that Ebola here would never look like Ebola in West Africa. It’s unlikely that Ebola would get any farther than a localized problem in one area, even in a worst-case scenario. Honestly…do we really “need” Rhode Island? Ebola is a difficult virus to transmit and is only transferred through bodily fluids: vomit, sweat and blood. It cannot go airborne which makes it usually containable by sophisticated health care systems. It’s extremely unlikely that someone would catch Ebola from simply being on the same plane or in the same public space with someone who was affected. Sooo, is it just us or are we the only ones who always get the middle seat? 3. Who you gunna call? Ghostbusters? While it is true… the current Ebola outbreak has been much tougher to contain, but its not impossible. There have been 33 previous outbreaks of various Ebola viruses on record and all have been controlled and stopped. So let the superheroes and paranormal specialist tend to inner city crimes and hauntings, we got this. 4. Leave the bucket list in the drawer. There are five types of Ebola viruses. The current Ebola outbreak has had a survival rate of about 40 percent, per the latest numbers from the World Health Organization. The one that’s causing the current outbreak (Zaire ebolavirus) has had an overall survival rate of roughly 30 percent outside of America, since it was first discovered in 1976. American doctor Kent Brantly is arguably the most famous Ebola survivor in the U.S. So dont stop, Believing… Hold on to that feeling! 5. Read up, know the facts! 6. Nice guys finish last. 7. There are 1 million ways to die in the west. 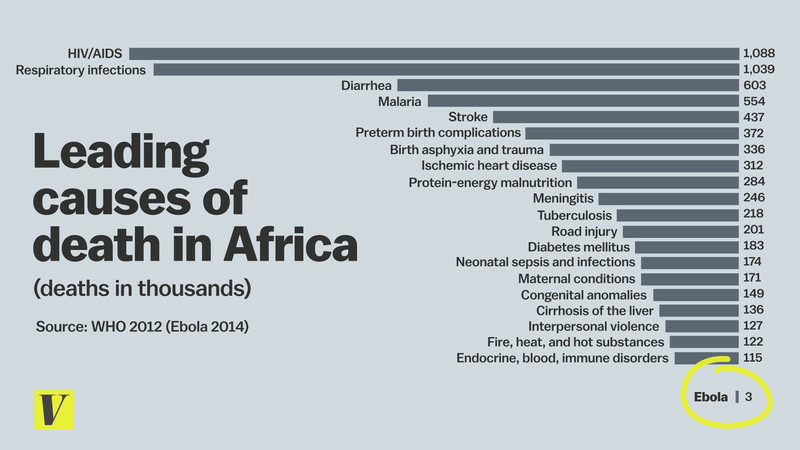 Yes, there are no cures, treatment or vaccines for Ebola currently. But organizations all over the world are working tirelessly to find a solution. So what does that mean to us? ENJOY LIFE, LIVE!! There is always something everyday that might kill us, so dont worry your life away. Tomorrow there will be something else and you’ve missed today. Be cautious, aware and knowledgeable and you will be fine. Did you pass the quiz? Have any important information or facts you want to share? Let us know in the comments below.